A runaway hit at numerous international music festivals, The Choir of Man hits the road for its first U.S. tour! It’s a party. It’s a concert. It’s interactive Broadway. It’s a pint-filled good time set in a working pub that combines bar-stool harmonies, high-energy dance, and live percussion with foot-stomping choreography. 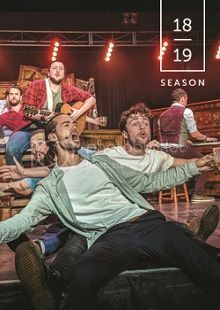 The multitalented cast of nine ordinary blokes sings everything—pub tunes, folk, opera, classic rock—all to roof-raising heights. It’s the best singing, dancing, stomping, pub-crawl-of-a-concert you’ll ever attend, with world-class tap-dancers, tumblers, singers, and musicians. Cheers!